On 22 June 1941, Adolf Hitler launched Operation Barbarossa, the German invasion of the Soviet Union. Over 3,000,000 men, more than 3,000 tanks, and over 2,000 aircraft advanced east to begin National Socialism's crusade to destroy Bolshevism and carve out &quot;living space&quot; for the Thousand Year Reich. During the first few weeks of the invasion, the Germans achieved staggering results, as whole Soviet armies were annihilated, thousands of aircraft were destroyed on the ground, and hundreds of thousands of enemy soldiers were captured. 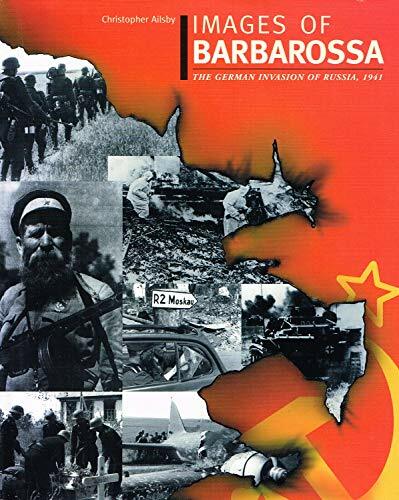 Images of Barbarossa includes photographs of Operation Typhoon, the attempt by three panzer armies to capture Moscow. However, Soviet doggedness and one of the coldest Russian winters in living memory combined to stop the Germans at the gates of the Soviet capital, and in the process dashed any hopes of bringing the war on the Eastern Front to an end in 1942. Then, the Soviets unleashed a counter-attack along the front, under which the German armies buckled but managed to hold - just. Drawing on many previously unpublished images sourced from Russian archives, Christopher Ailsby recreates the experience of war on the Eastern Front in 1941: the choking dust and endless steppes of the Ukraine, the glutinous autumn and winter mud that made movement by wheeled and tracked vehicles all but impossible, and the numbing Russian Winter, which froze petrol and killed thousands of ill-equipped German soldiers. Away from the battlefield, Images of Barbarossa features the alrocities of the German SS and paramilitary units that followed the armies into the Soviet Union to implement the murderous racial policies of Nazism. Many of the images are haunting, and convey the horror and destructiveness of war on the Eastern Front.